Darren Collison scores 23 points and Myles Turner adds 18 with 11 rebounds and five blocks, as the Pacers snap their two-game losing streak by handing the Bulls their seventh straight loss, 96-90. 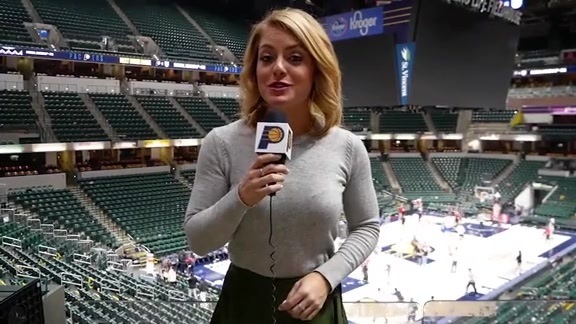 Dec. 4, 2018 - Pacers.com's Katie Hargitt wraps up Indiana's 96-90 win over the Bulls at Bankers Life Fieldhouse, thanks to strong performances from Darren Collison and Myles Turner. 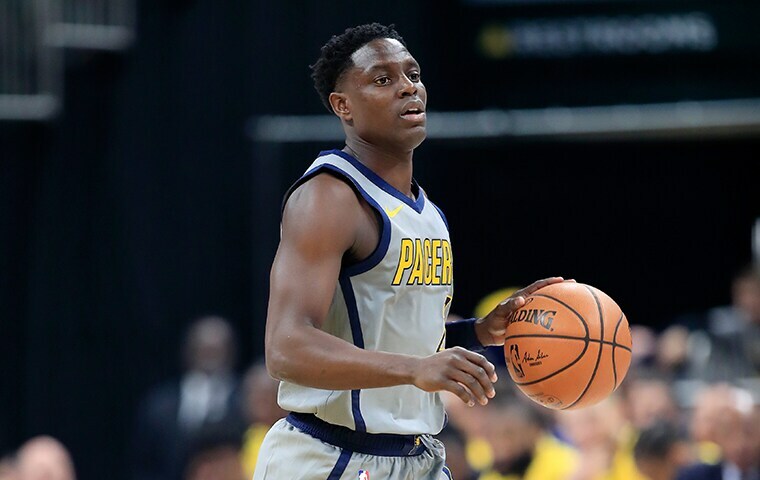 Dec. 4, 2018 - Pacers guard Darren Collison scored a season-high 23 points, going 6-for-7 from the field and 8-for-8 from the free throw line in Indiana's 96-90 win over Chicago. 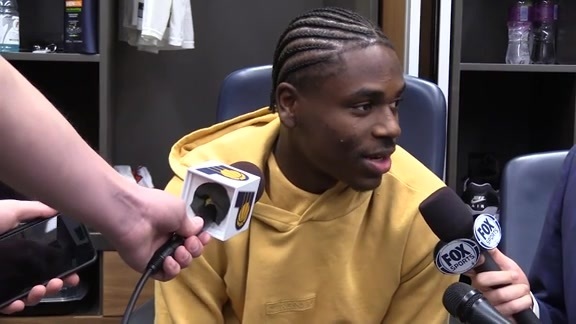 Dec. 4, 2018 - Pacers players Aaron Holiday, Darren Collison, and Myles Turner react to Indiana's 96-90 win over the Chicago Bulls at Bankers Life Fieldhouse. Dec. 4, 2018 - Pacers center Myles Turner had five blocks to go along with 18 points and 11 rebounds in Indiana's 96-90 win over the Chicago Bulls at Bankers Life Fieldhouse. 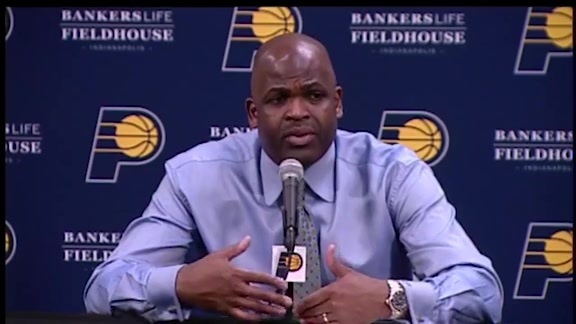 December 4, 2018 - Pacers head coach Nate McMillan spoke with the media following Indiana's 96-90 win over the Chicago Bulls on Tuesday night at Bankers Life Fieldhouse. The Pacers had just lost a home game to San Antonio back on Nov. 23, and Darren Collison was struggling. 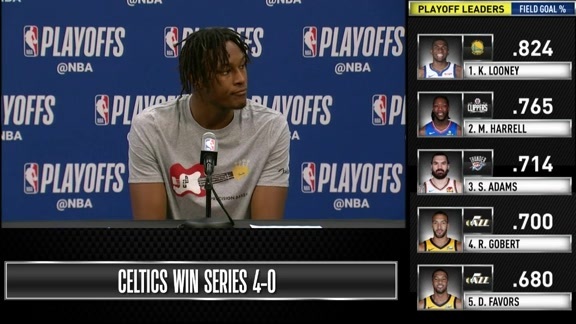 Struggling on the court, and then struggling with his emotions in the locker room. He had scored just four points in an 11-point loss, hitting 2-of-8 shots, and had failed to get to the free throw line for even a single attempt. "I just don't feel the rhythm at all," he said then, slumped in a chair in front of his locker. "I just have to keep (playing) and stop thinking. As a shooter, it's all about rhythm shots and not overthinking and just going out there and playing. Last year I had a better feel for the game. I just have to stay with it and catch a rhythm. "It's not fun right now." It's fun now, though. 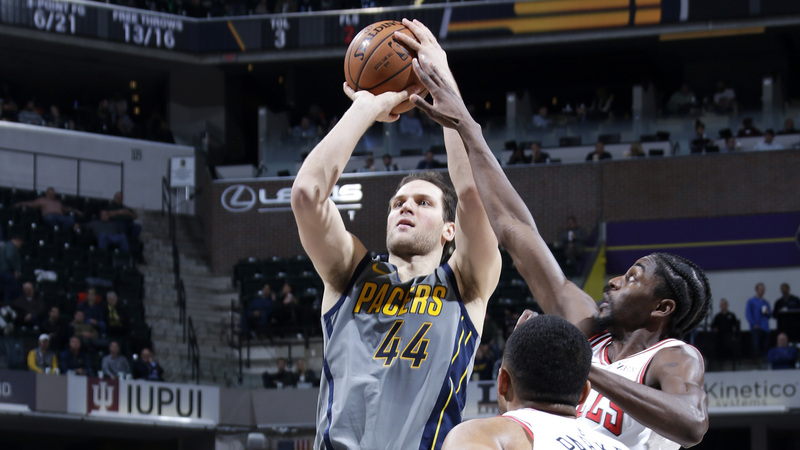 Collison scored a game-high 23 points on just seven field goal attempts in the Pacers' 96-90 victory over Chicago at Bankers Life Fieldhouse on Tuesday, hitting three 3-pointers in four attempts and all eight foul shots. 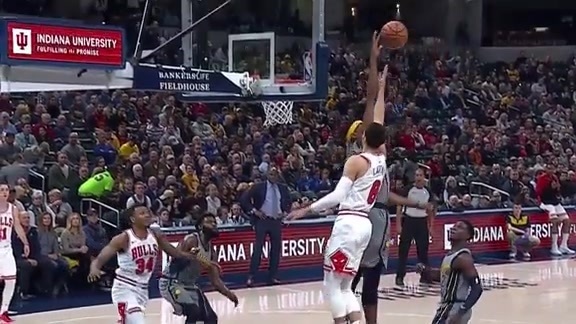 He was one turnover away from a pristine fourth quarter, in which the Pacers held on against a prodded Bulls team that was playing its first game under a new coach, Jim Boylen. Turns out that non-fun night against the Spurs was the start of a revival for Collison. What looked then like the continuation of a slump turned out to be the beginning of a revival that has him looking awfully similar to the point guard of last season, who led the NBA in 3-point percentage and assist-to-turnover ratio. Through the loss to the Spurs, Collison was averaging 8.9 points, 4.2 assists, 1.4 turnovers and 2.1 rebounds. In the five games since then he's averaged 12.4 points, 8 assists, 2 turnovers, and 3.4 rebounds. For the season, he's now averaging 9.6 points, 5 assists, and 1.5 turnovers, and his 3-point accuracy is up to 36 percent. "I was deferring too much," he said. "That's the type of player I am. I'm more unselfish than selfish. Sometimes to a fault. I kind of ice myself out of the game. As of late I just try to be more aggressive. If that means making plays for myself than others, so be it. "From now on you're going to see me be more aggressive, until we get our guy back." That guy, Victor Oladipo, won't be back this week. Coach Nate McMillan said before the game that Oladipo would not practice on Wednesday and Thursday. 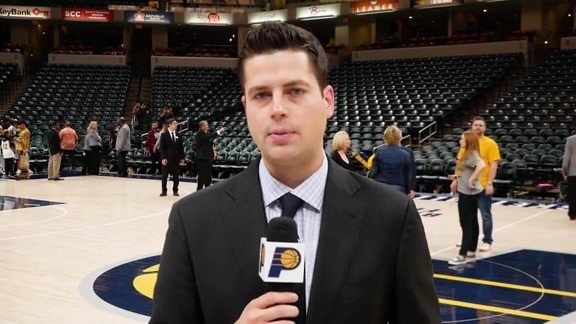 That means he won't play in the games on Friday or Saturday, because McMillan has said Oladipo needs to go through a couple of solid practices before returning to games. 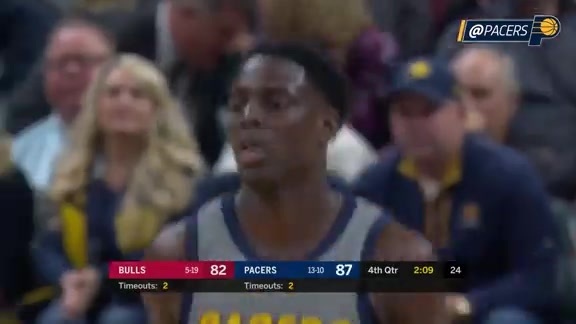 With the Pacers' leading scorer out the offense has no choice but to be more balanced, which means Collison has to push the tempo and look for his shot. Often passive while playing with Oladipo, who usually controls the ball, Collison is learning to take a more dominant role. The same is true for his teammates, who have come up with more balanced scoring efforts during Oladipo's absence because of a sore knee that now totals nine games, if the one against Atlanta in which he only played the first 4 1/2 minutes is included. The Pacers are 5-4 in those games, drastically better than their 0-7 record when Oladipo had to sit out last season. Collison as much as anyone is responsible for that turnabout, but is hardly alone. They're all learning not to defer. "It's not just me, it's all of us," he said. "We don't want to step on each other's foot so we tend to be more unselfish than just being aggressive. It wasn't so much me playing bad (before), I just wasn't as aggressive or comfortable. "It's always better when everybody's aggressive." Of course Collison's version of aggressive might be different than most. He only took seven shots in 35 minutes against the Bulls. He laughed when that was brought up to him. "In my world...," he said. "I mean, listen, I'm always deferring. It's not always got to be an assist with me. It could be giving them the ball, clearing out, making sure they feel comfortable. That's just the type of player I am." That's the player Collison was after re-entering Tuesday's game for the final 7 minutes, 41 seconds. He drove hard to the baseline, drew the defense of Jabari Parker, and dished off to Myles Turner for a dunk to give the Pacers an 83-77 lead. After Chicago got within three with 2:26 left, he hit a 21-footer out of the halfcourt offense for a five-point lead. The lead down to three again, he fed Turner for a mid-range jumper with 1:17 remaining. Collison then helped secure the victory at the foul line, hitting both attempts on consecutive possessions within the final 24 seconds. An aggressive posture enhances Collison's scoring opportunities. When defenses have to pay more respect to his penetration, it tends to leave him more open for jump shots. And he's as good a shooter as the Pacers have. "If D.C. can keep playing that way, his shots are going to be easy to come by," Turner said. So will the points. And it might just continue being fun. Have a question for Mark? Want it to be on Pacers.com? Email him at askmontieth@gmail.com and you could be featured in his next mailbag. Mark Montieth's book on the formation and groundbreaking seasons of the Pacers, "Reborn: The Pacers and the Return of Pro Basketball to Indianapolis," is available in bookstores throughout Indiana and on Amazon.com. Note: The contents of this page have not been reviewed or endorsed by the Indiana Pacers. All opinions expressed by Mark Montieth are solely his own and do not reflect the opinions of the Indiana Pacers, their partners, or sponsors.